A key point is that the mast and sail should be in line when the final pull to the top is made. A second line runs up inside the luff groove alongside the halyard, which is pulled to release the loop. These are pictured below. 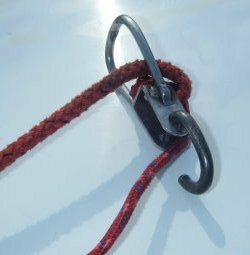 The halyard and the release are usually supplied as one continuous cord, knotted in the fitting, but they have quite separate functions. 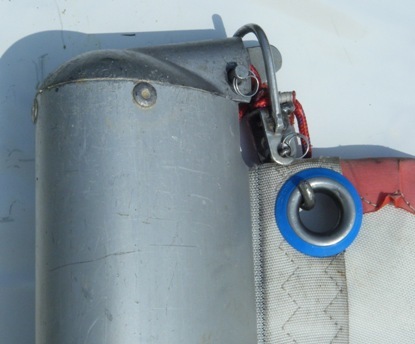 As shown, the halyard (the upper cord) runs through the ring, so that it is above the pivot point on the fitting (where the hook or shackle attaches to the loop) and the release cord (the lighter line in this case) runs under this fulcrum. 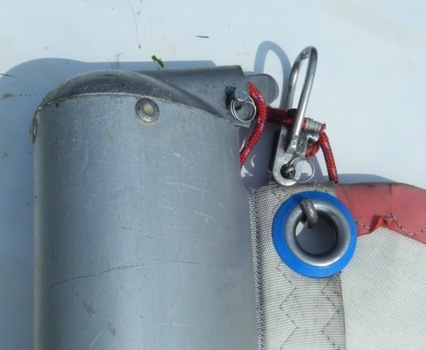 As shown, the release line must be slack when the halyard pulls the loop over (as otherwise it would pull it backwards) and this is set by ensuring the release line has some slack where it is tied at its lower end to the halyard. 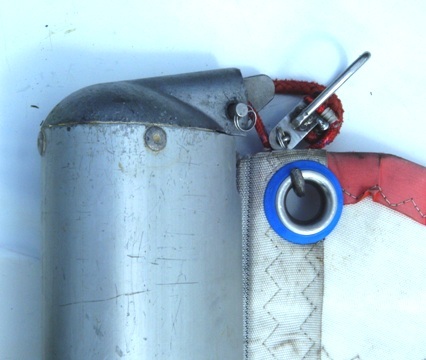 To release the loop, the release line (lighter line in this boat) is pulled (assisted by pushing up at the foot) and this pulls the loop up and back (photo below right) so that the sail comes down when pulled at the foot. This can easily have a roller or a sheave added for an easier and more powerful pull. Alastair successively added to the diameter of the roller, and then cannibalised a ball bearing block (with balls jumping around the garage at times) to give free running. 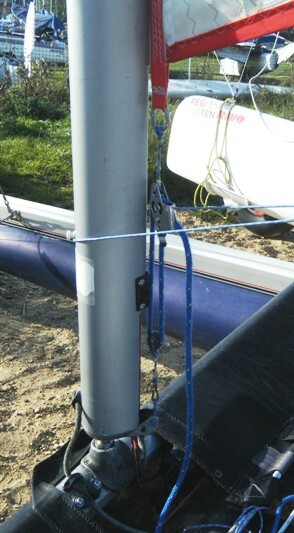 Alternatively, the advent of non-stretch Dyneema raises the possibility of ceasing to use any mast-head lock, and simply cleating the halyard off at the foot of the mast. This doubles the compression force on the mast, but this should not be a problem. 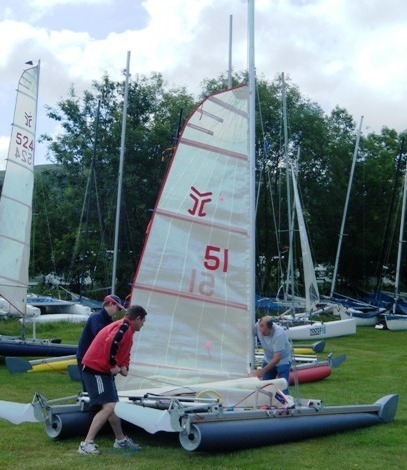 For the downhaul, the original 4:1 purchase, which most boats use (Photo left) was set up initially for the soft fabric TI sails. After the initial slack has been taken up (with about 3 inches of movement down) only about an inch of down�haul movement under tension is required to reduce the luff wrinkles. 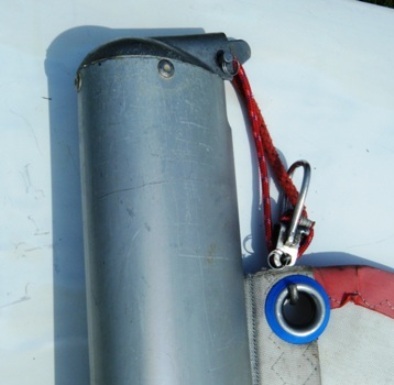 Too much downhaul tension, and power will be lost as the sail camber comes forward. The position against the measuring strip should be noted, for experimenting and consistency; it is not necessary to remove all wrinkles. Most sailors set the downhaul and do not alter it on the water, although theoretically releasing it downwind should be helpful.